The Mattes DSG Correction Half Pad with Sheepskin is designed without seams on the highest grade sheepskin available; E. A. Mattes Sheepskin Pads, simply put, are beyond comparison. A long time favorite among riders of all disciplines, Mattes are the go to pads in stables all over the world. Mattes Half Pads are anatomically correct, fit neatly under the saddle and can be used directly on the horse’s back or on top of a quilted pad that has a similar shaped top line. The anatomically correct topline design of Mattes Sheepskin Pads follows the contours of the horse’s back and allows for a perfect fit under the saddle. The patented SPINE FREE® Design ensures the spine is not in contact with any seams, fabric, or tension which eliminates the risk of rubs and pressure on the sensitive area of the back around the spine. Sheepskin has long been known for its amazing natural properties including heat dissemination, breathability, and the ability to eliminate friction and bounce. This cannot be imitated by wool pile, artificial fiber product, or foam. E.A. Mattes Sheepskin Pads are made with only the finest quality sheepskin and a one-at-a-time mentality that ensures product quality. Pads are handmade from start to finish with attention to detail that is unparalleled. Each hide is thoroughly inspected, hand picked for quality, and made with full hides to ensure no seams contact the horse’s back. The Mattes CORRECTION®-SYSTEM helps maintain balance and straightness for horses that change form through a season or have asymmetries. POLY-FLEX® Shims are resilient, do not bottom out like foam or other materials, and allow incremental adjustments to be made easily. The shims are 5mm thick, designed to be layered, and are easily trimmed with scissors to taper the ends and create a pressure free fit if multiple shims are necessary. Designed without seams on the highest grade sheepskin available. 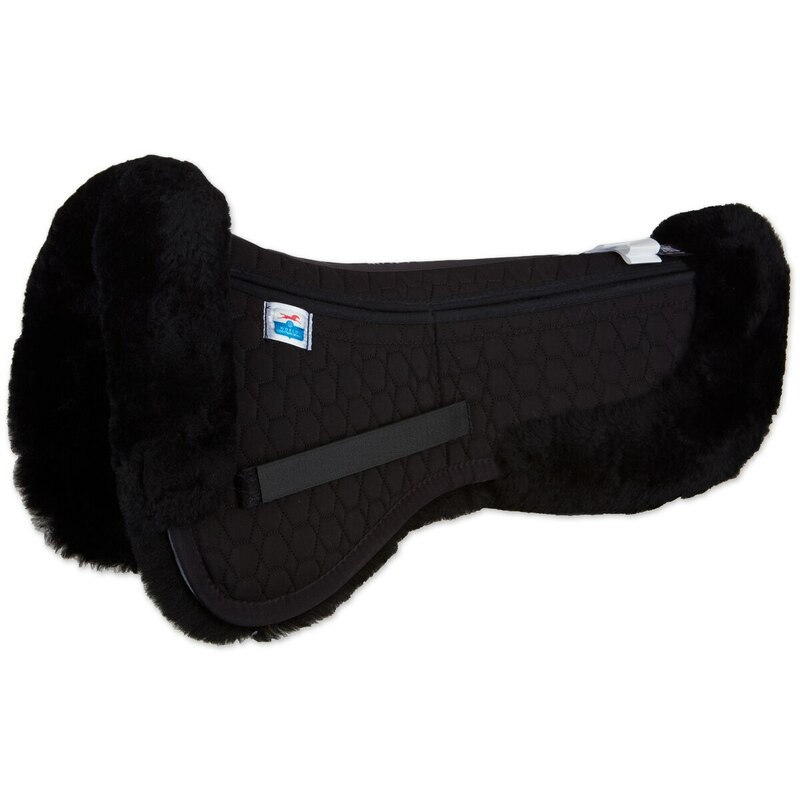 Mattes Half Pads are anatomically correct, fit neatly under the saddle and can be used directly on the horse’s back or on top of a quilted pad that has a similar shaped top line,. 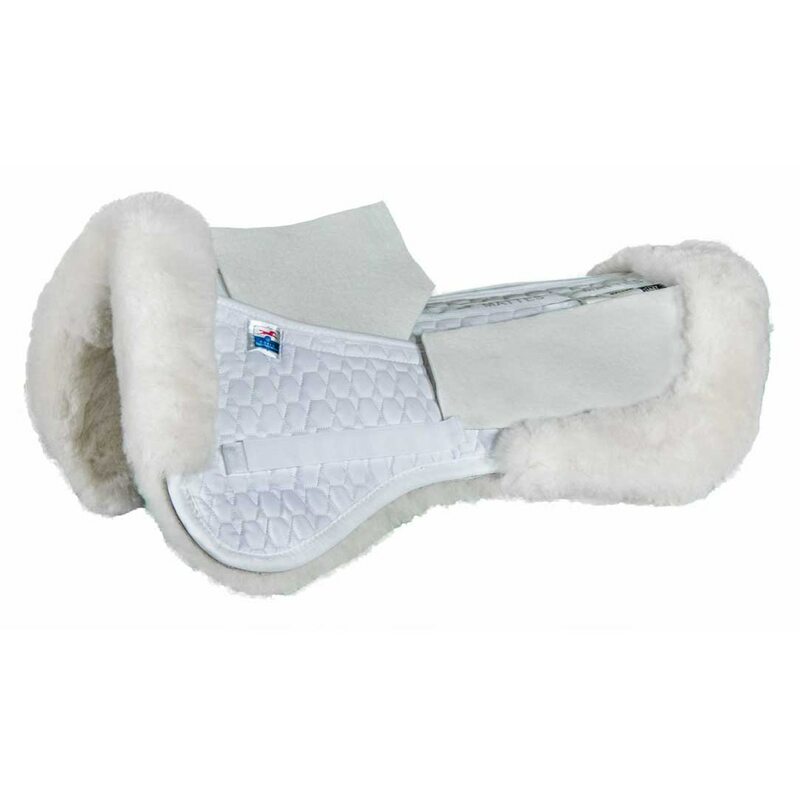 The anatomically correct topline design of Mattes Sheepskin Pads follows the contours of the horse’s back and allows for a perfect fit under the saddle. The patented SPINE FREE® Design ensures the spine is not in contact with any seams, fabric, or tension which eliminates the risk of rubs and pressure on the sensitive area of the back around the spine. Sheepskin has long been known for its amazing natural properties including heat dissemination, breathability, and the ability to eliminate friction and bounce. The Mattes CORRECTION®-SYSTEM helps maintain balance and straightness for horses that change form through a season or have asymmetries. POLY-FLEX® Shims are resilient, do not bottom out like foam or other materials, and allow incremental adjustments to be made easily. The shims are 5mm thick, designed to be layered, and are easily trimmed with scissors to taper the ends and create a pressure free fit if multiple shims are necessary. Wonder gag bit with stainless steel shanks and sweet iron chain mouth. Commonly used for barrel racing and roping but is actually quite mild and can be used on a wide range of horses fron green to mature horses.